« Public Meeting at Sulgrave Manor at 7 pm on Tuesday 28th May, to discuss proposals intended to secure the future of the Manor. 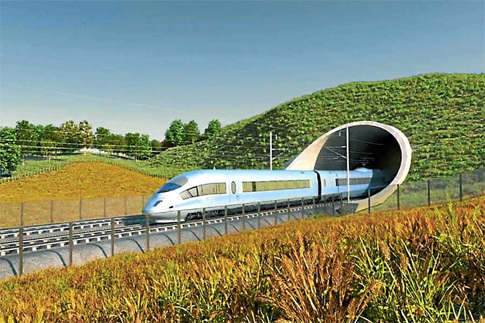 The draft Environmental Statement for the proposed Phase One London to West Midlands High Speed Rail Link (HS2) has now been published. It sets out the environmental impacts which have been identified along the route and the measures proposed for managing and reducing them. The assessment is set out in the following sections: agriculture, forestry and soils; air quality; climate; community; cultural heritage; ecology; electromagnetic interference; ground settlement; land quality; landscape and visual; socio-economics; sound, noise and vibration; traffic and transport; waste and mineral resources; and water resources and flood risk. The statement can be seen online at http://www.hs2.org.uk/draft-environmental-statement (All public consultation documents) and maps of the route at http://www.hs2.org.uk/interactive-map (insert your postcode to find your local information). A consultation event for the Greatworth to Lower Boddington Section will be held at Boddington Village Hall, Warwick Road, Upper Boddington, NN11 6DH on Monday 3rd June from noon until 8.00 pm. A consultation event for the Newton Purcell to Brackley Section will be held at Brackley Town Hall, Market Place, Brackley, NN13 7AB on Friday 14th June from noon until 8 pm. All the Environmental Statement documents and maps will be available. HS2 Ltd have confirmed that specialist noise consultants will be there. Comments on the Environmental Statement may be made up to July 11th 2012. Click here to see how to make comments. This entry was posted on Thursday, May 23rd, 2013 at 10:43 am	and is filed under News. You can follow any responses to this entry through the RSS 2.0 feed. You can leave a response, or trackback from your own site.